CATBALOGAN CITY – With the assistance of the City Social Welfare and Development Office, Mayor Coefredo “Tekwa” Uy, City Councilors Hon. Stephany Uy-Tan and Hon. Teodoro Ilagan gave out schools supplies at Silanga Elementary School Covered Court, Barangay Silanga to 390 scholars from different barangays on the morning of June 05, 2012. The following are the official rundown of scholars per barangay: San Vicente - 21; Old Mahayag - 34; New Mahayag - 29; Silanga - 65; Cabugawan - 28; San Roque - 32; Iguid - 43; Payao - 43; Pupua - 23; Estaka - 30; Palanyogon - 4; Bangon - 12; Libas - 3; Cagudalo - 7; Cagutian - 6; Albalate - 8; and Cagusipan - 2. Said scholars studying at different secondary schools each receive a brand new bag containing various notebooks, pad papers, and other supplies. Apart from the said school supplies, each of the scholars received a school uniform assistance of P1,000 cash and will receive a monthly educational allowance of P200 thereafter. This form part of Mayor Tekwa’s Scholarship Program that has been implemented since his election on 2004 up to the present aimed at assisting poor but deserving students who wish to finish their studies. The slogan of the Scholarship Program of Mayor Tekwa describes the importance of education towards upliftment from poverty and other social issues faced by families and communities. In helping one scholar at a time, Mayor Tekwa believes that education can really be the solution to society’s crippling problems. After the said turn-over of school supplies at Barangay Silanga, City Councilors Maximo “Max” Pescos and Teodoro “Teddy” Ilagan assisted City Councilor Uy-Tan in giving out the same school supplies at City Hall Lobby to the scholars from Barangay Basiao. Present during the turn-over was Hon. Virginia Tabon, Barangay Chair of Barangay Basiao. Councilor Uy-Tan, being a strong advocate of education and youth empowerment along with Councilors Pescos and Ilagan who are equally strong supporters of Mayor Tekwa’s Scholarship Program, believes in the power of education and knowledge to eradicate poverty and change lives. QUEZON CITY – Maynardo E. Valdez, the Information Center Manager of the Philippine Information Agency (PIA) office in Nueva Ecija who was sacked after his superiors discovered him in Boracay while he should been at work, was actually found liable for numerous administrative offenses. The 25-page decision penned by PIA Director-General Atty. Jose A. Fabia and posted on the PIA website (www.pia.gov.ph) is a consolidation of two cases containing seven administrative offenses Valdez was found guilty of. For the Boracay escapade, Valdez was adjudged guilty of grave misconduct. Records also show that Valdez was charged with gross neglect of duty for his failure to submit issues and concerns prior to a presidential visit in Fort Magsaysay in Nueva Ecija. “During a presidential visit, the PIA information officer is tasked to find and identify the issues and concerns in the ground level. Upon identification of such issues and concerns, the PIA information officer informs or alerts the concerned local authorities or cabinet secretaries/agency heads of such issues and concerns. Once identified, the issues and concerns are acted upon or ably addressed before reaching the President,” reads the decision. “As respondent did not submit the issues and concerns of Nueva Ecija when the President visited Fort Magsaysay in April 2011, he committed a blatant breach of his duty,” the decision continued. In another count of gross neglect of duty, Valdez was charged when he made only one article in 35 days when he is required to submit at least two articles and four situation reports daily and when he failed to submit weekly reports. "When respondent did not meet his daily minimum output of news, he deprived the public of knowing the good news in Nueva Ecija and at the same time deprived the people of Nueva Ecija of a forum to showcase the good news in their locality," the decision said. Valdez also did not submit a pre-survey result on the inaugural State of the Nation Address of President Benigno S. Aquino III. “The survey relative to the 2010 SONA is equally significant as this unveils the pulse of the people to aid the newly-elected President in addressing the public’s needs and views in leading this country to prosperity through the “tuwid na daan,” adds the decision. Relative to the Boracay escapade, Valdez was charged with dishonesty when he made it appear on his Daily Time Record (DTR) that he was on forced leave on the days he closed the PIA office while he was attending a high school reunion on the resort island. “Clearly, the respondent committed dishonesty when he wrote the words forced leave on his DTR the fact being that he did not file any application for such forced leave. Such act by the respondent is tantamount to falsification,” the decision read. Valdez was also charged with unauthorized absences and conduct prejudicial to the best interest of the service. Meanwhile, a story on Valdez’s Boracay escapade landed in the Top Four of rappler.com’s “The wRap your world in 10” for July 4, 2012. “The wRap” ranks top 10 hit news stories of the day around the world. CATBALOGAN CITY – The Municipal Health Office (MHO) of San Jorge, Samar conducted a schistosomiasis awareness and mass treatment at San Jorge (Samar) municipal covered court today, July 3, 2012. San Jorge Samar is the 2nd municipality that has the most number of schistosomiasis cases with 26 endemic barangays, while Calbayog City has the most number of cases with 33 endemic barangays. Samar Provincial Schisto coordinator Daniel Maravilla said that this is the 4th year of their mass treatment in the whole province. In line with this, Regional Schisto-Coordinator Agnes Cuayzon presented the Sentinel survey that shows the percentage of the whole region 8 in schisto cases. It shows that in 2011, Samar has 2.6 percent of schisto cases which went down to 2.2 percent in 2012 with only 10 endemic municipalities, considered as having the lowest schisto cases in the whole region. The early stage treatment lowered the rate of schistosomiasis cases in the province, the health worker said. Cuayzon added that the highest number of schisto cases in the region with 5.3 percent and 25 endemic municipalities is Leyte and the Eastern Samar with 6.1 percent and 11 endemic municipalities and 168 barangays. Northern Samar has 3 percent with 16 endemic municipalities and 168 endemic barangays. During the program Maravilla and Municipal Health Officer Dr. Gabriel Casuga discussed the symptoms of schistosomiasis like, abdominal pain, headache, diarrhea, high fever, and a stool with blood. “We can see the manifestation of schistosomiasis in ages between five and eight years old,” Dr. Casuga said. He also added that it is important to get a health check up even if there is no manifestation of schistosomiasis. Casuga said anyone aged 5 to 65 years old can take the medicine for schistosomiasis. Meanwhile, the local government officers, partners/stakeholders, guests, members of Philippine National Police, Philippine Army joined the mass treatment and showed their full support by taking the medicine during the activity. There were about 300 participants students from different schools in San Jorge, teachers and principals, community folks from the different barangays who joined the mass treatment and took the medicine for schistosomiasis. The medicines were provided by the Department of Health Region 8; PHO Samar provided the services when it comes to technical assistance in conducting advocacy. A fun run at six o’clock in the morning dubbed as “Takbo Para han Schisto”, was the initial activity from Barangay Rosalim through the major highway leading to the municipal covered court of San Jorge town. The participants were from the MHO, led by Dr. Gabriel Casuga, with the Provincial Health Office schisto team, partners and stakeholders, Barangay officials among others. San Jorge, Samar is still conducting mass treatment in different barangays every Tuesday and Thursday and their Municipal Health Center is open daily for consultation and medications. "My life was empty when I was in hiding"
HONG KONG – "For over a year, I was in hiding. My life was empty," said Myrna Reblando as she shared her story to a group of local and international journalists in Hong Kong. Myrna Reblando, the widow of Alejandro "Bong" Reblando, a journalist murdered in the 2009 Maguindanao massacre, was one of the speakers at a panel entitled "How the Prevention of Torture Promotes the Freedom of Expression and Journalism in Asia." The panel was held at the Foreign Correspondents' Club in Hong Kong on June 25th. The speakers at the panel discussed the importance of freedom of expression with regard to the prevention of torture, sharing from their own personal and professional experiences. "Thank God that I am here alive,” she said. “I can hardly imagine how close I was to death on so many occasions.” She expressed her deep gratitude to the Hong Kong Government for providing her shelter, food and protection during this time. Ms. Reblando also explained why she felt the need to tell her story. “I felt that my person is useless; I am only thinking and living for myself. I felt that those who had threatened me had achieved what they wanted: to silence me, to push me back. I knew that I could do something." With regard to the procurement of legal remedies, Ms. Reblando said that "to express freely in pursuit of justice is possible. It is so where there are people who are willing to listen and hear. What I have said in the past and what I am saying now would not mean anything if you do not write about it," she said. The event was organized by the AHRC and the Centre for Comparative and Public Law (CCPL) at the University of Hong Kong. QUEZON CITY – “This is where the people’s taxes go – to buy arms and ammunition to protect the interests of big business and landlords and against innocent civilians and those who defend their lives and livelihood,” said Karapatan spokesperson, Cristina Palabay on the praises heaped by the Armed Forces of the Philippines (AFP) to Pres. Aquino for giving the highest allocation so far for its modernization program; and amid the ongoing militarization of whole communities in Quezon. The military deployment in Bondoc Peninsula, according to Karapatan, is “unprecedented” because it has never happened even when the country was under martial law. Bondoc Peninsula is Quezon‘s agricultural center and hacienda belt. The area is rich in mineral resources targeted “as potential area for Aquino’s showcase program, the Public-Private Partnership known to have caused displacement of thousands of people in the urban and rural areas,” added Palabay. “The military’s concentration in Bondoc Peninsula is seen as a pre-emptive response to possible resistance of farmers due to displacement, to pave the way for the entry of numerous big business interests and to protect those that are already existing,” said Palabay. A fact-finding mission was held from June 25-July 1, to document the reported cases of human rights violations in the different towns in Bondoc Peninsula. “True enough, the initial reported cases of abduction, enforced disappearances, threats and harassment and detention of civilians in various communities are an understatement. The fact-finding/mercy mission was able to document more cases, especially children who experienced trauma due to the military’s presence in the barrios. Those who participated in the mercy mission were themselves victims of the military’s dirty tactics, and harassment,” said Palabay. Earlier, the mercy mission participants reported that the medical missions conducted by the military were used to warn people not to participate in the mercy mission of the Save Bondoc Peninsula Movement. “The military even went to the extent of threatening the people that they will be killed if they join the mercy mission. These military medical missions have now reared its ugly head, with no more pretensions,” said Palabay. BRGY MAGSAYSAY, Lope de Vega, Northern Samar – A total of estimated 11,664 board feet of assorted lumber were seized at Sitio Kalangkaan, Lope de Vega, Northern Samar by joint elements of the 20th Infantry (We Lead) Battalion, led by Sgt Diomedes Latasan, PNP personnel headed by SPO4 Juan Cuesta, and the Municipal Environment and Natural Resources, Mr Jojo Casco last July 01, 2012 at around 6:30 o’clock in the evening. The operation took effect after Mayor Erlinda P Cinco of Lope de Vega received an information that assorted lumbers are trapped along Kalangkaan River where she requested for the assistance from the PNP and the 20IB for the confiscation of the said lumbers. Upon reaching the area, the responding troops found the abandoned pieces of lumber, however, the alleged owner has already evaded the arresting troops after fleeing the area. LtCol Noel Vestuir, the 20IB Chief, in his report to Col Rolando Malinao, Commanding Officer of the 803Bde, based in Catarman, Northern Samar, said that the illegal lumber has a market value of more or less P256,608.00 based on the estimate by Mr Kenneth Yves Salon, the Chief Forest Protection and Law Enforcement Unit of the DENR. The said accomplishment was made possible through the cooperation, collaboration and firm resolve of the residents in the area to protect the forest against illegal logging activities. The timely information provided by some residents has enabled the authorities to sequester the items as an evidence of prevalent illegal logging activities in the area. The said seized lumber were hauled and now impounded at the Lope de Vega Municipal Hall for proper documentation and disposition. Col Malinao, 803Bde’s Commanding Officer commended the troops for a job well done. He likewise extends his thanks to the people in the area for the timely information provided to the responding personnel involved in the said operation. Mayor Erlinda Cinco on her part, expressed her thanks and gratitude of the DENR personnel, the Philippine Army, the PNP and the residents for their cooperation, full support and commitment that resulted to the success of the said operation. CATBALOGAN CITY – Pacific Partnership 2012 wraps off their Catbalogan City mission through the activity dubbed as "Street Children Interaction Day" organized by the City Government of Catbalogan through the City Social Welfare and Development Office and in partnership with Waray-Waray Youth Advocates (WARAYA) last June 30, 2012 at Guinsorongan Beach. More than thirty (30) street children identified by the CSWDO gleefully participated in the many arts and outdoor sports activities including a Paper-Folding Session, and several Traditional Japanese Toy-making Sessions with the Japanese Navy; and Soccer, Volleyball and Badminton Games with the US Navy. Amidst the scorching heat of the sun, a warm exchange of not only pleasantries but of wonderful cultures was experienced when the US and Japanese partners tried and tasted traditional Filipino and Catbalogan dishes and the street children and the youth volunteers from WARAYA got to experience authentic Japanese food and desserts. 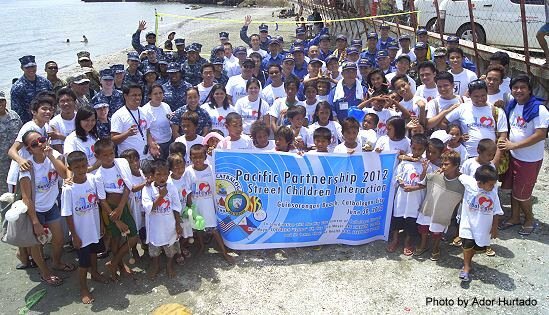 One of the highlights of the event was the official turn-over of Hygiene Kits and Toys for the street children donated by both the US and Japanese Navy. In grateful recognition for the partnership, the City Government of Catbalogan thru City Councilor Hon. Stephany Uy-Tan gave out a framed Sangguniang Panlungsod Resolution in full support of PP12 dated February 2012, a framed tarpaulin that reflected the many PP12 activities held in Catbalogan City, and several limited-edition "Catbalogan Higugma-a ta!" t-shirts to both the US and Japanese Navy partners. It was a fun-filled day for everyone who got to experience the sun, the sea, and the warm Catbaloganon spirit. "Thanks for everything. This was probably the most enjoyable event and hopefully we get to see you all soon!" as exclaimed by Lt. Mark Poblete, Local HA/PH/NGO Coordinator / CDS 7 when asked about the event. Indeed the warm pacific sun was comparable to the warm hospitality of Catbalogan City and its people. MANILA – Vice President Jejomar C. Binay said the Housing and Land Use Regulatory Board (HLURB) will now require real estate developers, brokers and contractors to strictly comply with rules on requisite permits before they could sell housing units. Binay said HLURB Chief Executive Officer Antonio Bernardo met with officers of the Subdivision and Housing Developers Association (SHDA) and discussed various complaints of homebuyers. Bernardo noted that some developers market lots or housing units of their projects even without having complied with certain HLURB requirements. “Some developers offer attractive and lower prices and incentives to prospective buyers during the pre-selling stage. This is done to ensure a successful marketing strategy while at the same time avoiding paying a premium for the cost of developing and completing the project,” Binay said. “Hence, the law has set certain guidelines to safeguard the interest of the buying public,” he added. Binay reminded developers that under PD 957, otherwise known as “The Subdivision and Condominium Buyer’s Protective Decree”, a project developer, owner or dealer may not sell any subdivision lot or condominium units unless it first obtains a license to sell from HLURB. Binay said this mode of disposition includes a contract to sell, a contract of purchase and sale, an exchange, an attempt to sell, an option of sale or purchase, a solicitation of a sale, or an offer to sell, directly or by an agent, or by a circular, letter, advertisement or otherwise. Meanwhile, the SHDA promised to cooperate with HLURB and to remind its members to comply with the rules on registration and issuance of license to sell for residential subdivision or condominium project. The HLURB is the national government agency tasked with regulating the real estate industry.